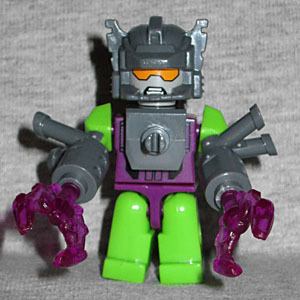 I'm Scorponok, and I'm always one step ahead of the game. If you think you can outsmart me, you've got another thing coming - in the form of my toxic tail! I'm big, I'm bad, and if the Decepticons know what’s good for 'em, pretty soon I'll be in charge! In the comics, Scorponok actually was one of the leaders of the Decepticons. But to be fair, the title of Decepticon Leader got passed around like a collection plate at church. I'm pretty sure Bumblebee was the Decepticon Leader for five minutes at some point. Anyway, Scorponok was a city-sized Decepticon, the equivalent of the Autobots' Fortress Maximus, but as a Kreon, he's the same size as everyone else. There's a tampo pattern on his chest, but it's covered by a piece that inexplicably has an axle sticking out the front of it. Why? As part of the first series of blind-bagged Microchangers, Scorponok reuses a lot of pre-existing pieces - for instance, his head was originally Sideswipe's, and his claws were alien weapons in the Battleship line. They're translucent purple plastic here, which I think means they're supposed to be made of pure Energon, but whatever. His scorpion tail is attached to his back, but doesn't rise up over his head. The "insect" legs on his arms are also from Battleship: they were gun supports. Scorponok's altmode is a little more complex than Sunstorm's was. You turn his chest cap around, remove his legs, plug the tail into his waist, and attach a strut to his chest so you can move the bug legs down there and have him stand. He definitely ends up looking more like a scorpion than Sunstorm looked like a jet. Losing the robot legs really changes the look of the toy, even if the head is still clearly just a robot head that's pointing down, nothing insectoid at all. Sunstorm looked better as a robot than a jet. 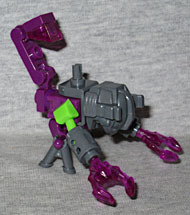 Scorponok looks better as a scorpion than a robot. Maybe eventually there will be a Kre-O Microchanger that will look good in both modes.